It's up to you whether you choose to follow one, all or none of the following tips. the idea behind these tips is to make the most of a quiet month and actually enjoy it so why not take the time to organise yourself, plan new adventures and realign your goals? #1 SLEEP // make sure you are getting enough sleep. ideally between 7-9 hours. when you know what time you need to get up the next morning, work back and figure out when you need to be asleep by to ensure you get a sufficient amount of shut eye. #2 TAKE A BATH // at least once a week, take a bath. i like sundays best as i can properly relax and gather my thoughts before the week ahead. light plenty of scented candles, put your favourite face mask on and sit back and relax. #3 ORGANISE YOUR PURSE // whether you have never thought to do this or simply don't think you have the time, take just ten minutes to do this. i often see people in a fluster as they can't find thier bank card or car parking ticket. truth is, this situation can be avoided. once a week clear out all receipts, throwing away the ones you don't need and filing the ones you do need. carry only the cards you need - you don't need to carry your national insurance card for example. #4 TIME // take a few moments to really think what you want to achieve this year. having a plan will guide you in the right direction and make your goal seem far more attainable. #5 SHOPPING LIST // lists, lists, lists. take the time to figure out exactly what you need to buy and write it down. this ensures you won't forget anything and will hopefully help you avoid spending extra money on the things you don't need. #6 DECLUTTER // try not leave things lying around and if you don't need them get rid of them. the whole less is more concept applies here and will help clear your mind. #7 DAY PLANNER // basically a cute diary where you write your own notes as well as jot down important dates. 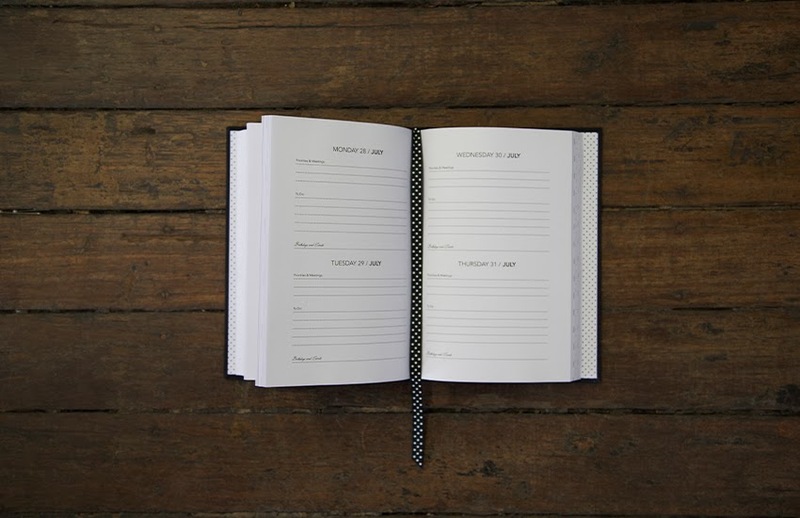 something like the diary pictured above from an organised life would be ideal. Whitney English's Day Designer would be an amazing alternative too. Great list! Live is great when it is organised, I feel less stressed. I think i'm going to buy a planner to help me keep even more organised. January for me is to try and better myself than the year before. So far I think i've become more active and don't waste my days as much. Great tips...I'm trying (and failing) to organize myself better this year!! Loving these tips, I'm determined to make 2014 the year for organised and stressless living haha. Really great list of things to do. I definitely have to keep all of these in mind. Agree with all that's on this list! Great list! Sounds just like me, i'm every single one except for #2 I've always thought of baths as wasteful. I tend to have really quick showers, turn off while I lather up but I've been thinking about putting a nice hot, long bath into my routine just to relax and unwind. Stopping off at Lush soon! Great post! For me, january is like a mental reboot. A fresh start, if you will. This is perfect and has made me feel so motivated! If only i could take baths... I'm back at school. I always miss my baths so much! These are all such wonderful resolutions for anyone to take on. Especially sleeping adequate amounts!! Wonderful tips! Thanks for sharing Michelle. I need to do a few of these tips. I hope your staying warm this winter :), it's very cold here and there is plenty of snow.